Lori from Lori's Story tagged me today. It was a good thing, because winter's bleak days were not inspiring me to write about anything. Now I have something to write about. Thank you, Lori! My picture story: We've had a snowy winter. When I heard that a melt was due after the last snowfall, I decided to take my doll's size tea set outside to the snow and take pictures. I added some sugar cubes, a few candy's, and some miniature Christmas balls and set a tea tray. They looked quite pretty set out on the fresh, white snow. I had a fun time trying different settings and poses with my tea set in the snow. Thanks for tagging me. Now I have to try to figure out how it works! What an awesome idea for a photo shoot...I admire bloggers that can put together these vignetes and then photograph them so well. I'd be glad to play along. I will post this soon. I still love your snow picture. Your beautiful blog and especially the photography inspired me to begin blogging. It's hard to believe but I am celebrating one year of blogging. This photo is a fabulous example of your outstanding photography! That made such a beautiful photograph. Have you ever considered creating notecards with your pictures to sell? What a great idea for a meme. I may have to try it when I dig out from my stack of tests... semester time. ARGGGGH!!! 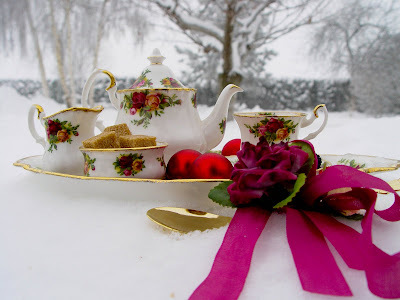 Neat idea-- photo of country rose tea set on top of blanket of white snow!! Enjoy your blog! This is one of your most beautiful photos ever. The colors sure pop in the snow.